“If the dust originates from the atmosphere, this suggests that we are missing some fundamental process in the Martian atmosphere,” said LASP Research Associate Laila Andersson. 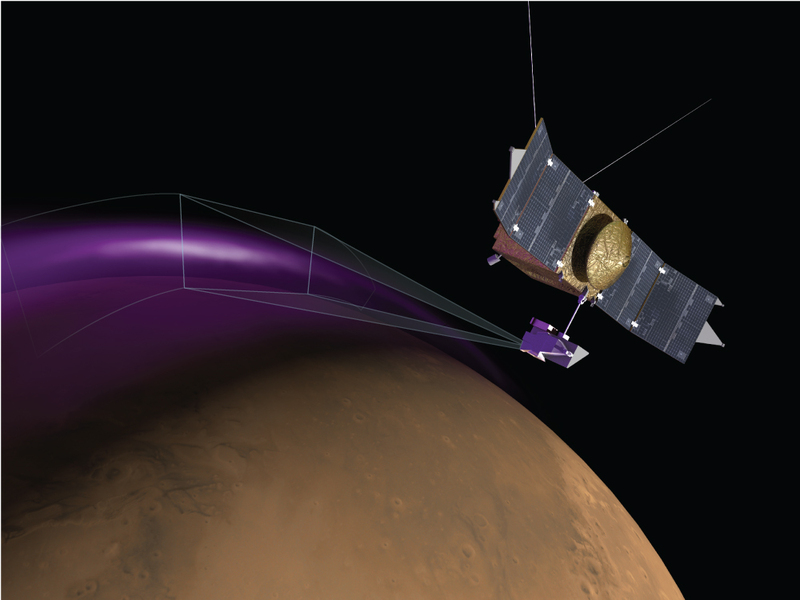 The cloud was detected by the spacecraft’s Langmuir Probe and Waves (LPW) instrument—built at LASP and the University of California, Berkeley—and has been present the whole time MAVEN has been in operation. It is unknown if the cloud is a temporary phenomenon or something long lasting. The cloud density is greatest at lower altitudes. However, even in the densest areas it is still very thin. So far no indication of its presence has been observed by any of the other MAVEN instruments. Possible sources for the observed dust cloud include dust wafted up from the atmosphere; dust coming from Phobos and Deimos, the two moons of Mars; dust moving in the solar wind away from the sun; or debris orbiting the sun from comets. However, no known process on Mars can explain the appearance of dust in the observed locations from any of these sources. MAVEN’s Imaging Ultraviolet Spectrograph (IUVS)—designed and built at LASP—observed what scientists have named “Christmas lights.” For five days just before Dec. 25, MAVEN saw a bright ultraviolet auroral glow spanning Mars’ northern hemisphere. Auroras, known on Earth as northern or southern lights, are caused by energetic particles like electrons crashing down into the atmosphere and causing the gas to glow. “What’s especially surprising about the aurora we saw is how deep in the atmosphere it occurs—much deeper than at Earth or elsewhere on Mars,” said LASP Research Associate Arnaud Stiepen, an IUVS team member. “The electrons producing it must be really energetic,” he said. The source of the energetic particles appears to be the sun. MAVEN’s Solar Energetic Particle (SEP) instrument detected a huge surge in energetic electrons at the onset of the aurora. Billions of years ago, Mars lost a global protective magnetic field like Earth has, so solar particles can directly strike the atmosphere. The electrons producing the aurora have about 100 times more energy than one gets from a spark of house current, so they can penetrate deeply in the atmosphere. The findings are being presented at the 46th Lunar and Planetary Society Conference in The Woodlands, Texas. MAVEN was launched toward Mars on Nov. 18, 2013, to help solve the mystery of how the Red Planet lost most of its atmosphere and much of its water. The spacecraft arrived at Mars on Sept. 21 and is four months into its one-Earth-year primary mission. “The MAVEN science instruments all are performing nominally, and the data coming out of the mission are excellent,” said CU-Boulder Professor Bruce Jakosky of LASP, the principal investigator for the mission. MAVEN is part of the agency’s Mars Exploration Program, which includes the Opportunity and Curiosity rovers, the Mars Odyssey and the Mars Reconnaissance Orbiter spacecraft currently orbiting the planet. NASA’s Mars Exploration Program seeks to characterize and understand Mars as a dynamic system, including its present and past environment, climate cycles, geology and biological potential. In parallel, NASA is developing the human spaceflight capabilities needed for its journey to Mars or a future round-trip mission to the Red Planet in the 2030s. NASA’s Goddard Space Flight Center in Greenbelt, Maryland, manages the MAVEN project. Partner institutions include Lockheed Martin, the University of California, Berkeley, and NASA’s Jet Propulsion Laboratory.